You won't find a better selection of beautifully designed faux flower arrangements than what we have below. If you've been looking at adding decorative artificial flower arrangements into your home but you're not sure where to start, then this article is for you! We have put together tips on how to select the best arrangement for your home. Before you pick the first faux flower arrangement you can find online, you first need to know your room's color scheme. You'd also be able to find the best piece for your home if you know what type of look you wish to achieve. Whether it is a dainty, whimsical feminine space or a more rustic garden style, find an inspiration and then create a plan as that will get you started. We recommend you continue reading this article as we've also featured our top picks on the available flower arrangements online. When you're trying out what works best in your space, don't be scared as most people shy away from different heights and textures of an arrangement's elements. Interior stylists would even suggest that you contrast delicate forever flower arrangements with rough textures of wood. When you’re styling your home, you would see that faux flower arrangements with a lot of different heights and textures look great next to tall ornaments and short candles. All of these decorative pieces combined will create a one-of-a-kind point of interest in your room where the eye will be drawn to. Realistic faux flower arrangements aren't cheap. However, they will look and feel so much better compared to cheaper ones even when years have already passed from when you purchased them. Don't be afraid to splurge as flower arrangements can lift your room's ambiance. If your budget won't allow for expensive pieces, buy one that looks the closest to the real thing. Remember, a real-looking flower is never shiny. Now, you are ready to decorate your home with delicate flowers placed on beautiful vases. As promised, we've listed the best decorative faux floral arrangements you can find on the internet today! Check them out. Made from just the right mix of natural and synthetic materials, this hydrangea flower arrangement is a go-to for fussy celebrities and interior stylists. It is sold individually with faux water inside the decorative vase that's made to look real but is actually clear acrylic. 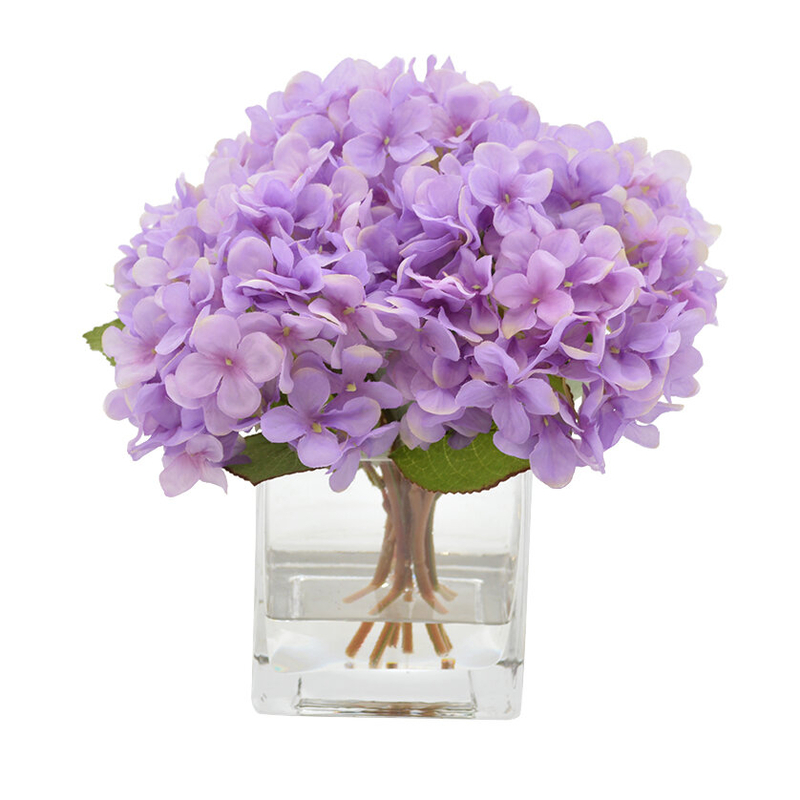 With the soft purple color of the flowers, it will be a sure hit during your next special occasion. Full of dimension, it's the only flower arrangement you need to lift the mood of your space. The leaves and lilac flowers are bursting from the decorative vase and the entire arrangement features a dense, authentic-looking cluster of blooms with green leaves underneath. It's sure to look incredible on top of a work desk, small side table, or low bookcase. Bring a sunny day's brightness to your room with this artificial Phalaenopsis orchid that will last years! Its several lively blooms all arch gracefully over the dark green leaves. Since the arrangement features realistic leaves, perfectly reproduced roots, and lovely pastel colors, it's an arrangement that's guaranteed to add charm into your living room. Add some sense of timeless beauty into your interiors with this exquisite flower arrangement. The crisp, vibrantly hued petals adorn the lush blooms, creating a cozy and warm ambiance that is sure to please. The backdrop of feathers and rich foliage makes for the best compliment to the ravishing arrangement. With several faux blooms rising above a clear vase, this arrangement of calla lilies has the right hint of color that will bring some elegance to your space. It features the right number of calla lily flowers together with realistic and delicate blooms. Settle this piece next to a picture frame, but it would also look beautiful even when it's set alone on a table. Add the graceful appearance and beauty of a garden into your space with this decorative artificial hydrangea arrangement. The piece comes with vivid yet delicate blooms that have settled within a clear vase. Standing at less than 8 inches, you can easily incorporate this in any room. This artificial Easter Basket Flower Arrangement by National Tree Co. comes complete with Easter eggs and a handmade basket! It is a diverse work of art that contains several elements for spring fun! From blue and pink eggs with glitter, leaf stems, and bright and cheery flowers, this lovely faux arrangement is sure to impress all of your guests this season. This artificial lilac's unique design will surely draw eyes with the large blooms that are elegantly complemented by several green leaves. The arrangement comes in a clear glass vase that doesn't distract this arrangement's regal and elegant appearance. It will be the best accent piece on your dining room table. This stunning Artichoke Topiary is among the most fascinating accents for tables available. It is a magnificent arrangement of textures and shapes which make the artichoke an interesting plant. The arrangement captured the wondrous qualities of the plant in this centerpiece. it is skillfully crafted out of the finest materials as well. The cheerful artificial orchid arrangement of World Menagerie will instantly bring brightness into your space. It's a bundle of white dancing lady orchids and sharp green leaves that are bursting forth a beautifully crafted glass vase. It will make for a gorgeous decor piece inside your home.